In Pennsylvania, winter is something to be reckoned with, especially if you're one of the poor, unfortunate souls who lives in Northwestern Pennsylvania aka "The Snow Belt." Winter here is brutal: Snow up to your knees, eyes and nose frozen by the breeze and; yet, life doesn't cease. Pennsylvania is a winter wonderland in which many don't get the chance to experience. So, here's what winter is like from one of the snowiest cities in the nation. Only 3 inches of snow last night? What a blessing. Or, 8-12 inches expected within the next 24 hours - bring it on Pennsylvania. Forget dressing to be cute or comfortable, when living in Pa. in the winter one dresses for warmth - even if at the expense of looking like the Michelin Man. "I plowed the driveway this morning, I'll be fine for awhile..."
Winter in Pennsylvania requires consistent plowing and even then there is still excess snow. Real temperature: 15 Degrees (Thank you, wind chill). Can you say "tropical heat wave?" There may be 8 inches of snow that fell overnight, wind chill that dips the temperature to the low 20s, and roads covered in snow and ice but it doesn't matter, a little winter weather can't stop you. I could've left 15 minutes ago if it weren't for all this snow and ice to clear off. 8. Hearing "just take your time." "Just Take Your Time" aka Pennsylvania's version of goodbye. Winter in Northwestern Pennsylvania's "Snow Belt" isn't for the faint of heart. It takes someone who is slightly crazy and not afraid to turn into the abominable snowman each time they step outdoors. Even though Pennsylvanian's love to complain about the bone-chilling cold, and feet of yearly snowfall, they wouldn't trade their winter wonderland for the world. It may sound crazy to those who don't live in this area as to why someone would voluntarily put up with this miserable weather but it's how we were raised and having survived another Pa. winter is a victory. 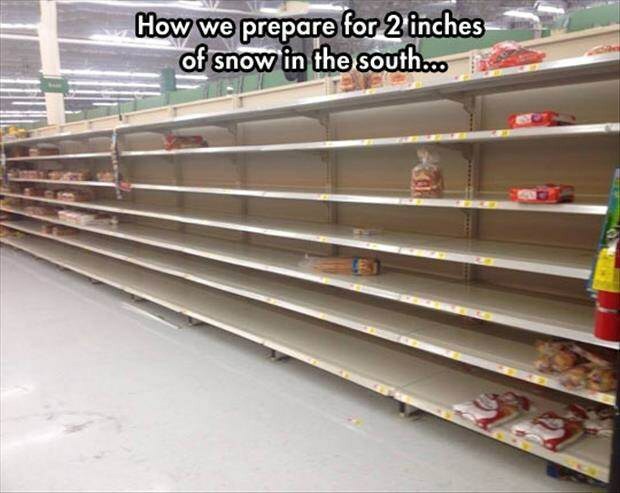 Plus, we get to the last laugh when the Southerns declare a State of Emergency over their mere dusting of snow.